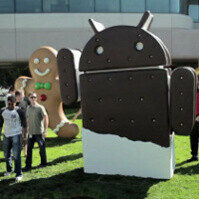 Android Ice Cream Sandwich: what will Google treat us with on October 18th? Android Ice Cream Sandwich (ICS) is probably the biggest update to happen to Android for its three-year lifespan since the launch of the first phone on the platform, introducing many elements from Honeycomb and bringing phone and tablets together into a single unified platform. Google calls it their “most ambitious release to date.” The search giant and Samsung were expected to announce it back on October 11th, but they postponed their CTIA event to allow more time after the passing of Apple’s chief executive and industry visionary Steve Jobs. Now, however, things are settled for October 18th at the AsiaD: AllThings Digital conference. Samsung promises the event to be BIG as it will most probably present us the Nexus Prime, but it’s Google’s Ice Cream Sandwich that will end up on many Androids after that and could be even more important. We’ll - of course - have a live blog on October 18th starting at 7:00 pm PST | 10:00 pm EST, so prepare for a nice geeky evening on Tuesday. 1. Tron-ified. Android Ice Cream Sandwich will bring a big redesign. Cold colors and neon highlights, all coming from a parallel futuristic Tron-esque world. Or from the land of Honeycomb tablets, that is. The similarity is striking. If you ever thought Android looked somewhat like iOS, this redesign will make it hard to trace the matches. Actually, given the numerous lawsuits against Android from all sides, Google might have decided to make a leap to more distinct visuals and thus protect its platform from design patent claims. 2. Minimalistic icons in the menus. The set of icons has also changed and now we have a beautifully simplified set of black and white icons in the menus following the less-is-more design principle. 3. (Nearly) Ubiquitous navigational buttons, straight from Honeycomb. If you thought, buttonless applied to Ice Cream Sandwich, you’d better redefine buttonless because the three virtual navigational buttons will be with you nearly everywhere in ICS. When they become irrelevant such as in the camera application, they will simply dim out, but - judging from a leaked video of allegedly the Nexus Prime - the space on the screen reserved for them will remain as a black unused spot. 4. Visual multitasking. It’s a new way to multitask, kind of. New for handsets, but it has been directly copied from Honeycomb, so some of you have already seen it. What’s good about it is that it’s visual - it shows the state of the app where you left it. What’s bad about it is that it takes a lot of space, so you can only see about three apps on the screen without the need to scroll around. The biggest deal about ICS is its ambition to bring an end to fragmentation and become a single stop for both tablets and smartphones. Google promises to release the source code, so we can expect an eruption of ICS tablets and smartphones from all kinds of sources (China, hello!). Google also promises regular updates and unification of its update policy, but it will also introduce previously Honeycomb-only features to phones and one of the most anticipated ones is USB hub. This basically allows you to connect peripheral devices such as keyboards and mice, greatly boosting productivity. New APIs will be released to devs, and Google has already given some details about how programmers should rework their apps in preparation for ICS. Finally, we have some fancy new features like face recognition in the works. When it comes to the apps, we’ve already seen that Google Music has been reworked, signalling that some other apps of what we call the Google suite of apps (Maps, Gmail, Latitude, etc.). Got your expectations pumped about Android Ice Cream Sandwich? What is it exactly about the platform that you think will make it or break it? Let us know in the comments below. can't wait to get my hands on one.. I am SOOO excited for ice cream sandwich. I have been waiting for months for Google's next update. Android just keeps getting better and better. This is AWESOME!!! get ready for THE best OS out there! I was about to automatically thumb down your comment until i read it. Are u being sarcastic? Of course he is. But sarcasm isn't funny without irony, which his statement utterly lacks. I love android am kinda cited for icream as much as the nexus I wish the moto razor came with ics but any way everything sounds great but two main things I want better. First is the keyboard. Apple has always had I think by far the best typing experience. Well unless you are used too swype stuff. The next and most important thing I want is battery life on 4g phones. One thing I notice about the iPhone (I am passing on the 4s for prime or razor) does better than android and it could be that android is mor open and this is my fault but when I put my iPhone to sleep it will have almost the same amount of power as when I turned it off. My droid x and bionic drain quite a lot. But overall battery life. iPhone included. Wether it's new battery, hardware or software tech I would like that to be in proved on. But with the specs of the nexus prime I am guessing it's a blood sucker and you will need another battery. Let me ask a stupid question....I'm looking to buy new phone and am making the jump from Apple to Android. How do the Android updates work? Should I wait for the ICS phones to get on the market before buying a new phone, or can I buy a SGS2 now and receive an ICS update in the near future? Thanks for the help, and feel free to ridicule my stupidity. That is not a stupid question. It depends on what kind of user you are. If you like to tweak things a lot, are familiar with tech stuff and can manage yourself by reading step by steps and guides, you don't have anything to worry about updates since XDA Developers will frequently update you with the latest versions of android, long before the official updates. If you are the kind of user that don't like to mess too much with your phone, only likes official updates and is satisfied with your phone out-of-the-box, than you better wait for the Nexus Prime, so you can get ICS by default. Proto, that's not very nice. We should not call each other names. We must be mature here. Miz, you know why this is moderated. Just a reminder - please, be nice. oh YES! You are so right, I should definitely follow PA's single standards. I will definitely be nice from now on. You are all so awesome. PA, without you, I couldn't get any info on cellphones. You will not be able to post comments for a few days. Please make sure not to use another account, so you won't get permanent ban. Miz does have another account, actually. It's named AwesomeMiz. Several months ago I caught him posting on it (he posted as The_Miz, then responded to a comment I left for him as AwesomeMiz, then switched back). Just thought I'd let you know. Even phonearena team is. Getting annoyed at you, lol..
We are working on it. We will soon publish the official written rules and will start limiting (and banning) users who don't play nice. thank you. i come here for my phone info and to ask people questions when needed. i dont come here for people to be rude to me. Trolls are the best part of my day. I like to see the witty jabs at the others persons OS/phone of choice. You know what miz I have an iPhone and and android I like them both. The main thing if I stayed with one kind I would get bored of it. I am really even thinking about windows phone when it catches up hardware wise. And feature wise. Kinda weird that windows 6.5 could do more than almost any one of these platforms if you were smart enough to use it right. If it wasn't for the screens they had . Any way the reason I thi k your not really worth chatting with is its like if we talked about foot ball and all you did is talk about idk let's say pits burg and nothing else and if I brought up something good about Detroit lions or something in the game you put it down and only talk about pitsburg and compare everything to them. While pitsburg is really great football I really like football as a sport and like every part of it and can even admit troy polimato is really great even though I don't like pitsburg. That is you in a big nutshell. Chained to the iPhone while a lot of people like my self have love for the technology and see the good in both. Actually all of them palm and windows phone and blackberry. That was long but confusing but what I thi k about your coments everywhere. You have nothing really important to say. It's all either someone else's idea or it's childish. I have been watching your coments.